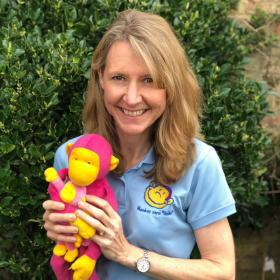 Hello, I'm Jeni and I am delighted to be running our award winning Monkey Music classes in Putney, Barnes and Fulham. As a teacher and mum of three, I'm passionate about the importance of music in young children's lives. Our classes are a fabulous way to embark upon the musical journey with your baby or pre-school child. Having been involved in music education for over 25 years, I know that music is fundamental to a pre-school aged child’s development. It’s such a fun way to learn! As a music teacher myself, when I had my first baby, I knew that a music class was the most important class for him to attend. Children are natural, instinctive music makers, I wanted to find something that was tailored to his developmental needs and to introduce music in a fun and interactive way. Monkey Music fitted the bill perfectly. Many years on, I still love our classes, they remain fresh and exciting with quality music at the heart. For babies from 3mths to pre-school children up to four years, our proven and progressive, age appropriate musical curricula has been carefully honed over 25 years. Children learn best when they are captivated, engaged and enjoying themselves. With children grouped in small classes according to age, each class is carefully structured, perfectly pitched, and jam packed with learning opportunities, catchy music, great resources, the finest percussion instruments, movement and dance activities and lots of energy and fun! Our classes are very deliberately only 30 minutes long. We cover a lot in that period of time, and we know that any longer can be overwhelming for tiny growing brains that are taking in so many new things. Parents and Carers love Monkey Music classes too! Grown ups need lots of fun too! Music is good for children because music is good for everyone! Our interactive classes are a great opportunity for parents to spend special time together with their child without the distraction of everyday life. Children are particularly responsive when sharing music with their carer, it’s a great way to develop reciprocal communication. One of the lovely things about the classes is the lasting friendships made over the years; all our venues in Putney, Barnes and Fulham have great cafes nearby, perfect for a catch up before or after class! Award winning children’s music activity classes for babies and toddlers in Putney, Barnes and Fulham. Since classes first started in 1993, Monkey Music’s hugely popular classes quickly became the ‘must-do’ activity for babies and children in London. 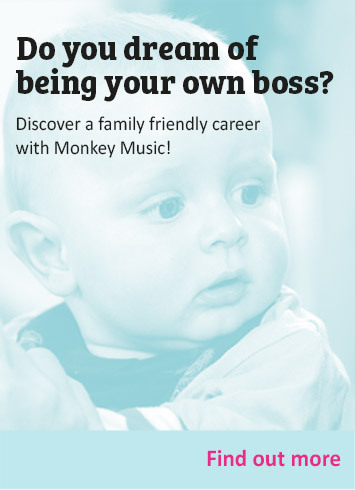 Now across the whole of the UK, thousands of families attend Monkey Music classes every week. Here in Putney, Barnes and Fulham, Monkey Music has become a rite of passage for many babies and nursery age children and their parents! Monkey Music has been nominated for and won several important awards including Best National Pre-Schooler Development Activity, Best National Toddler Development Class, and Best London kids class. Research has found that exposure to music early in life supports a child in almost all areas of development. Children who attend a music class show improved memory, they smile more and develop better communication skills. Music can help your child reach their full potential, and it’s such a brilliant way to learn so many different important skills. We often have parents saying how Monkey Music has helped prepare their children for starting nursery and school. Our teachers are all actresses, performers and musicians, with boundless vitality and enthusiasm. Mostly parents themselves, they all adore babies and young children, and all bring something special and unique to their classes. 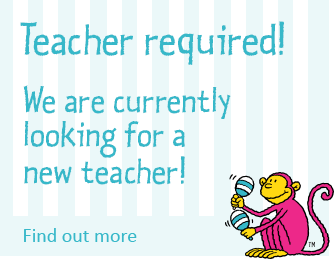 You can find out more about our teachers below. Growing up in tune with Monkey Music! BOOK YOUR FREE CLASS HERE! "My daughter's eyes light up as we approach the door knowing what's ahead, 30 minutes of fun, learning and creativity. It's the highlight of our week and we always leave with a big smile on our faces! Magic." "I've particularly appreciated watching my son's physical co-ordination with instruments and clear understanding of a beat develop through each stage. I'd thoroughly recommend it to any parent"
"Of all the classes out there to choose from, this is definitely a must. I have made some great friends through our weekly class, I'm not sure who enjoys Monkey Music more, the adults or the children!" "Monkey Music is an amazing class, it's one of the most favourite times of our week. Fun for both parent and child, it's a great celebration of music, done in a really beautiful, clever way"
"We've watched our daughter gain new skills, grow in confidence and learn to listen as well as sing and play. It has been so fun to use the songs and skills from Monkey Music outside of class too"
"I am constantly amazed at Jeni's enthusiasm, patience and kindness towards all the kids. Thank you Jeni, for taking such good care of us!" Celebrate with Monkey and Mo! Monkey Music parties are great fun for babies and children of all ages. Parties are tailored to suit every occasion and always include the birthday child’s favourite Monkey Music songs! "We booked a party for our daughter's first birthday - what a success, everyone had a wonderful time, babies, toddlers and the grown ups!" Monkey Music holiday workshops are a popular way to keep children entertained during the holidays. Unlike our regular classes where children are strictly grouped according to age, the holiday workshops cater for a mixed age group of children. "My eldest particularly loved going along to the Monkey Music workshop, sharing the experience with her younger siblings and remembering all her favourite songs. We all had a great time, thank you!" Come along to our FREE open days and events and find out what happens at Monkey Music! Since they began, in 1993, over 4.8 million classes have entertained hundreds of thousands of families across the UK! Book your space for some magical music making with your family. Suitable for babies and young children. Be quick! Places are limited. No events currently on our system. Check back soon. "The music and child development event was fascinating, I left with lots of activities to try at home and I learnt so much. It was magical to see just how captivating music can be for tiny babies"
Jeni has been teaching Monkey Music in Putney, Barnes and Fulham for over 16 years, sharing music with lots and lots of local families She loves singing and entertaining and educating babies and young children, and thinks she has the best job in the world! Pippa joined the team in 2015. She comes from a long line of musicians, is classically trained in piano, and has also sung lead vocals in a rock band. 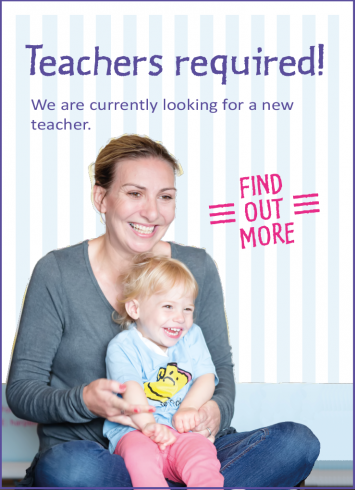 A local mother of three, she loves teaching and adores working with children; her classes are carefully honed to be a really fun learning experience. Sarah is passionate about music education - for all ages! 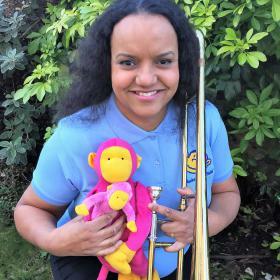 When she's not at Monkey Music she's a school singing teacher and keen trombonist. Sarah says "I love Monkey Music, it sets the foundation for a lifetime of music." Sarah has been teaching Monkey Music for 8 years. Jenni's little girls both grew up with Monkey Music, adoring every second, and as an actress and a mum, Monkey Music fits perfectly with Jenni's skills. Jenni says "I love to watch how each child's confidence grows in class, and my girls love it when I practise at home!" Chloe studied Music and Voice at the Consevatoire, and as a singer and performer thinks it is so important to introduce music to children as early as possible. 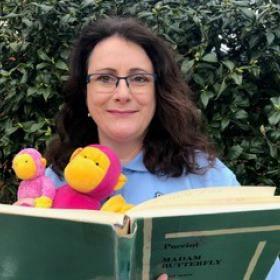 "Monkey Music is one of a kind, with a curriculum that really supports a child's development in a fun, nurturing environment"
Fabienne is a professional Soprano, who performs opera and also teaches singing. Having been introduced to Monkey Music by an operatic friend, she enjoys teaching it so much. She loves the way even the youngest baby is encouraged to feel the beat. Her favourite song is Peek-a-Boo! Amalia is a professional singer and her extensive career includes worldwide performances with Beyonce and Lionel Richie. Her huge love of life shines through in her classes which, along with her bubbly, infectious personality make her classes a huge hit! What do the classes involve? Monkey Music is an interactive award winning musical curriculum. Classes are small and tailor-made for babies and young children who are grouped according to their age. Each child is accompanied by their carer. Little monkeys sing, dance and play musical instruments. Big monkeys join in the fun too! Can babies relate to music at such a young age? The ear is the first organ to develop fully in the womb. From five months, an unborn baby can hear the world around them. Early exposure to music encourages babies to develop their musical ear which supports all aspects of early learning and development. Just as language skills are developed early in life, so is musical talent. Regardless of the level of music aptitude with which children are born, they must have formal and informal experiences in music to maintain that level of potential. Are all the teachers musically trained? All Monkey music teachers are specifically trained on delivering the Monkey Music curriculum. Many of them are professional musicians and teachers. How long is a class? Half an hour. Each 30 minute class is a significant step in our progressive curricula. Classes are carefully planned to maximise the attention span of a very young child so that they learn from sharing a rewarding, enjoyable and worthwhile experience. At what age can my child start Monkey Music? From 3 months old. Can I try a class before I sign up to a course? Yes. You and your child are invited along for a free complimentary class when making an initial booking enquiry. How much does a class cost? Please ask at your local Monkey Music Office. Do I have to pay a term in advance? Yes. After your first complimentary class you reserve your place and are invoiced pro rata for the remaining classes in the term. Families who attend our classes will often bond with their teacher and other members of their group. In order to reserve places so that everyone can be together we facilitate a termly booking system. This also encourages our families to attend regularly so that everyone learns new skills at the same pace. Do classes just run during term time? Regular classes run during term time. Many areas also run seasonal Holiday Workshops during school holidays. What happens at a Monkey Music Birthday Party? See More Fun on the main website. Where can I buy Monkey Music merchandise? Please click here. Why pay a membership fee? When enrolling in Monkey Music for the first time, a child becomes a member of the Little Monkey Club. New members receive a Welcome Pack, including a Monkey Music T-shirt and a singalong promo CD as well as access to our online club which supports the child in their learning experience at Monkey Music. The membership fee is payable when registering each child in regular weekly classes at Monkey Music and we offer a discount to siblings who join at any stage. Siblings receive their own welcome pack and T-shirt to wear to class. Ask your local classes for more details. Is it OK for me to take photos or video in class? No, we politely request that you refrain from taking photos or videos at class. Can I opt out of the membership fee? No, our online club is designed to support the learning experience of children at our regular classes. Can I bring a sibling? Yes! We offer discounts for siblings, ask your local classes for more details. Do I have to sing along? We love it when our customers join in and your children benefit from hearing the sound of a familiar voice, no matter how good or bad! Do I have to be musical? No! Our teachers will make you feel welcome whatever your musical ability. Why don’t you offer drop-in classes? We value musical education as a fundamental part of early development, and as such our regular weekly classes are progressive to maximise the learning potential of each child. Can I bring my newborn too? Yes! Newborn babies are welcome in our classes, please speak to your local classes for more information. What do I need to bring with me? Everything you need to enjoy our classes is provided by the teacher. What if I can’t make my usual class? You are welcome to catch up with any classes that you miss. Speak to your local classes to book a catch up class. What makes Monkey Music classes so special? Monkey Music classes are considered a leading light in pre-school education. Come along for a free class to see for yourself what make Monkey Music classes the highlight of the week for so many families across the UK! Why is Monkey Music more expensive than the other music groups around? Monkey Music has been established for over 25 years and is proud to have a rich musical heritage. We offer a unique and progressive learning experience for your child, which is supported by over 500 original songs and musical activities. Our talented teachers are carefully chosen and trained to offer the highest standard of pre-school music education. Why are Monkey Music classes 30 minutes long? Our classes have been honed and developed over 25 years and are designed to fully captivate babies and young children for the duration. The very interactive nature of every class means that our little monkeys need to rest again after 30 minutes of magical music making! What do you expect of the children, do they have to sit down the whole time? Each class is carefully structured and formatted so that every child and carer is encouraged to join in with the fun. Classes are paced according to each age group with the opportunity for little ones to be up on their feet during ‘Time to Move’ and sitting with their carers during ‘Time to Play’ and ‘Time to Sleep’. 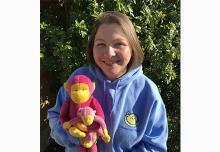 Most children quickly learn what is happening next and Monkey helps them with friendly encouragement! Do you offer ‘mixed age’ classes? Because of the progressive nature of our curricula which is age specific, we do not offer regular weekly mixed classes. However, during the holidays, many of our teachers offer mixed age holiday workshops. Join us at The Barnes Children's Literature Festival!